The building that is today The Farmhouse pub is the original farmhouse of Hewitts Farm and on a map dated 1602 the land to the east of its location is named Olde Hewitts and that to the west, Newe Hewitts. This map was prepared for Christ's Hospital when it bought much land in Horley around that date. While the farm is not shown, there is every likelihood that it did exist at that date and as was often the custom, the farm was named after its owner. The family name of Hewitt can be traced farming in the district back to the 14th century, but no record confirms that one lived at this farmhouse. By 1657 Thomas Woodman owned it along with another property closeby and had to pay 3 shillings and 4 pence (17p) annual quit rent for both. This payment released him from manorial service. The farm was built on what was then the north east corner of a huge open common that stretched southwards for some two miles. It was one of several farms around the common that most probably used it to pasture its cattle. The farmhouse looked towards the windmill that stood during the 19th century, alongside the old original Langshott Lane, hence nearby Windmill Close. The central part of the farmhouse containing the front door and bar is the oldest section and was probably built with its chimney early in the 17th century. The wall between the extension to the rear is of light timber framing and this addition known as an outshott, is thought to have been built later in that century. The part of the house to the left of the bar was added, possibly in the 18th century with its own chimney attached to the original stack. This is thought to have been the farm parlour and retains the wooden fireplace and plank door to the left concealing a winding staircase. The right hand crossover wing was added in the 19th century and during that period the lower part of the timber-framed frontage was bricked in and the upper part tile -hung. The tiled gables to the rear and the front porch were added in the 20th century. The building is Grade ll listed to ensure that no major changes can be made to the building that will interfere with its important features, or its historic fabric, without special Listed Building Consent. Except for a 19 year period around the turn of the 19th century, the occupiers of the farmhouse are known. One notable occupier in 1936 was a solicitor, who it is said acted on behalf of Mrs Wallis Simpson during the abdication of Edward Vlll. Another interesting period was from the 1930s to the 1960s. A row of willow trees was grown alongside the lane to the west of the farm. These were used to make cricket bats that were named after Stuart Surridge, the well known Surrey and England cricketer who lived in nearby Great Lake Farm from 1952 to 1956. Several of the other farmbuildings have, over the years been converted into residences including the large barn alongside. 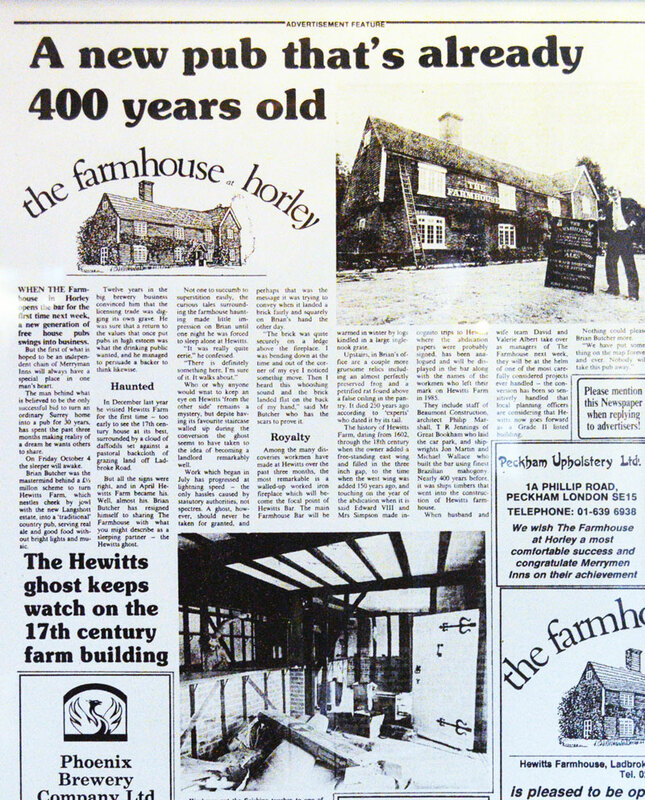 In October 1985 The Farmhouse was converted to a public house and has remained so since that date. The Farmhouse is also believed to have a friendly ghost called Mabel Hewitt who died after falling down a staircase.